Even as the Parliament finally got down to debating the much awaited intolerance issue, a remark by CPI leader Mohammad Salim has led to the Lok Sabha being adjourned. Quoting an Outlook report, the leader said that Home Minister Rajnath Singh told the magazine's reporter, "Modi was a Hindu ruler in 800 years". The Home Minister immediately protested against such a comment being attributed to him. He said: "I am hurt. I never made such a comment. If any home minister makes such a comment, he must resign." To this Speaker Sumitra Mahajan said that Salim must take back his words and that before making any allegations against anyone in the House a prior notice was needed. However, Salim refused to relent saying that he was only quoting for a reputed magazine and that Rajnath should thank him for bringing it to his notice that he was being misquoted. What is interesting, the late VHP chief, Ashok Singhal was reported to have made this comment in 2014 after Narendra Modi came to power. He was quoted by media houses as saying: "Eight hundred years after it (the power at Delhi) went away form Prithviraj Chauhan, it did not come into the hands of a proud Hindu. 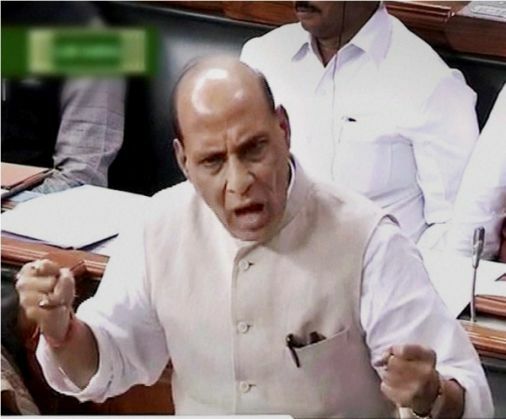 It has happened after 800 years,"
CPI leader Mohammad Salim began the intolerance debate in Lok Sabha. Prior to the ruckus over the Outlook report, Salim launched a scathing attack on the government for calling ongoing movements like Award Wapasi and comments by eminent personalities on intolerance as "manufactured dissent." Before the debate began, Rajnath Singh said that although his government didn't believe that there was an atmosphere of intolerance in India, they were participating in the debate to understand the Opposition's point of view. He further added that if at all there was intolerance, the Opposition must suggest ways to deal with the situation.